December | 2012 | tap this! There’s nothing like good ‘ole charitable events and thoughtless generosity right around the holidays to remind us what it’s really all about: Beer. Wait, I meant hope, peace and love. Ok, maybe some beer too. That’s exactly what the “Pour to Restore” event held over the weekend on Staten Island was all about—giving back to the community. 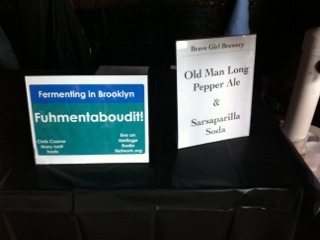 And thanks to the creativity and commraderie of a bunch of local home-brewers, the event was a success and raised close to 3K for the employees of Staten Island University Hospital who were affected by Super storm Sandy. Sean Torres, President of the Pour Standards Home-brew Club on Staten Island organized the event along with other members of the club, Philip Gardner and Doug Williams. On Sunday at 120 Bay Café on the North Shore of the borough that was greatly impacted by October’s storm, about 20 home-brewers from around New York City and even New Jersey, offered attendees pours of their brews. Raffle tickets were sold with the chance to win an introductory home-brewing kit from Brooklyn Homebrew or an introductory home-brewing class from Brooklyn’s Bitter & Esters. The brews ranged from standard American Pale Ales and IPA’s to more experimental brews like a “Belgian Patersbier,” and a Spearmint Chocolate Stout. 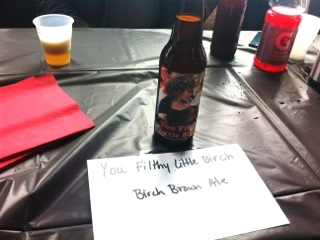 Some brewers even got a little cheeky with their names, like Terrence O’Brien and Dave Haber whose “Filthy Little Birch,” a Birch Ale, had a label of “Sandy” from Grease. The home-brewers at the event didn’t mind giving a little sucker punch to the storm and embodied the spirit of perseverance. It’s amazing what a little home-brew can do! 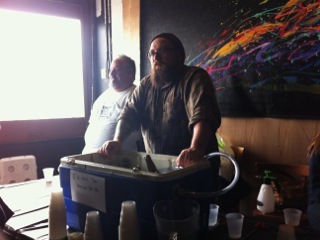 Check out our photos from the event and go to http://www.pourtorestore.com/ to see a list of participating home-brewers and what they made. Sorry to leave our readers in suspense—it’s just when you have such an extra ordinary experience, it’s hard to put it all into words. Most of you have probably visited a brewery before—you are taken on a tour, get samples in the tasting room, learned more about the brand and its history—you leave a little more informed and a little more drunk than when you came in. Every brewery seems to have its own nuances. Our visit to Harpoon was especially unique because Al Marzi, Chief of Brewing Operations and a guy who’s been with the company for 21 years (almost since its inception), was our own personal tour guide. He started in the company lunchroom, a modest place with an admirable collection of random hot sauces (why do beer and hot sauce always seem to go together?). From there he walked us through the “factory”–visiting a brewery always seems to be a Willy Wonka-type experience. You see where they mill the grains, mash them, sparge and then add hops and other spices to the wort. If you’re lucky, you’ll be entertained by the bottling line (always even more fascinating when you’ve already tasted a few brews)—this particular bottling line applies a label on both the front and back of the bottle—oooooooo. Al also pointed out where they will soon be installing a canning line. While they currently can their signature IPA, UFO, and their summer seasonal at upstate FX Matt Brewing Co. in Utica, NY, you can anticipate a bigger canned selection soon due to this new addition. 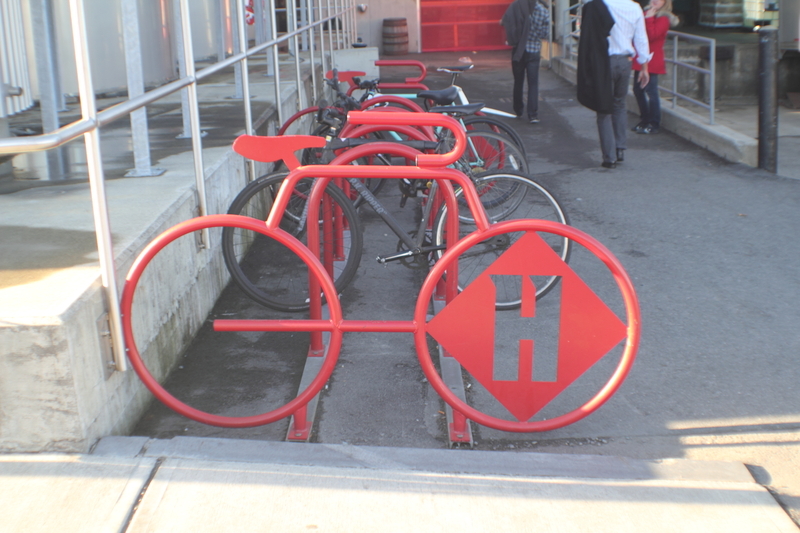 So now for the biggest news of all—Harpoon is opening a large beer garden-type hall where future tastings will take place and tours will take off. You bet we’ll be there for the Grand Opening! A few days before our visit, the Harpoon staff had a company holiday party where they celebrated the end of “Movember,” in the not-yet-opened beer hall, at their “Stache-bash” all while giving back to some local charities. Moustaches for a great cause? Yeah, we love that! Al himself earned special recognition with his “checkerboard” beard, a signature pattern on all of Harpoon’s beers (it was unfortunately absent upon our visit—we bet Al couldn’t wait to get rid of it!). For photo evidence, check out their Facebook page. 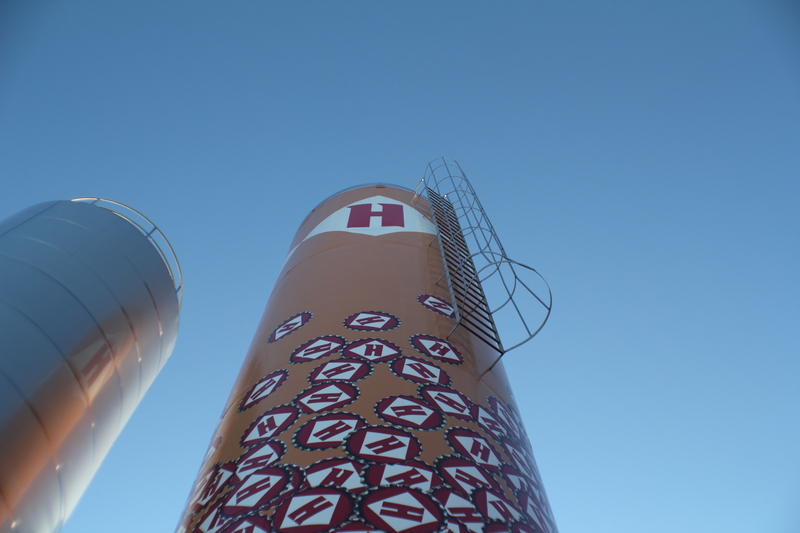 Our visit to Harpoon was certainly a highlight on our trip to Boston. But even if you can’t make it up to the brewery, you can still drink their beer locally. If you visit Harpoon’s Web site, you can use their “Beer Finder” tool to seek out the beers near you—whether it be a case of their Wintry Mix, their Chocolate Stout on tap, or their latest 100 Barrel Series. 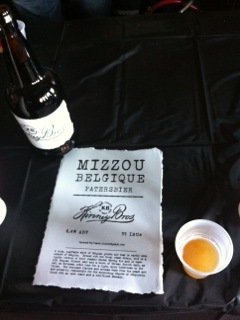 For more about their beers (and what we tried and thought), check out my last blog post. We can’t wait to go back early next year and check out the new beer hall for ourselves…but until then, we’ll just have to drink a Winter Warmer…or two.